There are many Bluetooth speakers available in the market for those looking for convenience of portability. The Mpow® Armor is a portable Bluetooth speaker, it's waterproof, dust-proof and shockproof and is up for grabs at an affordable price of $33.99 on Amazon.com. It is also eligible for shipping in India. The speakers are promoted as having 'rich immersive sound' offered via a 5W strong output power and a passive radiator. The makers claim the speakers are suitable for use in the shower, around the house, by the backyard pool, while hiking, camping, and rafting or on the beach. To support such indoor/outdoor use, the speakers are designed with a cutting-edge waterproof technology up to Class Five. The speakers come with a USB charging cable, a 3.5mm audio cable and a user manual. The Bluetooth Mpow Armor speakers are aesthetically designed with a rugged-looking geometric black high quality plastic body with mean black speaker/radiator grilles, complemented by assorted colour accents that you can choose from. At around 12.8 ounces, the Bluetooth speaker is incredibly light, which makes it easy to carry; it can be conveniently hung on your belt by stringing the lanyard through-hole. The ports for USB and AUX are neatly fitted on the body under a reasonably sturdy cover. The controls are simple – a power button and two previous/next buttons that have to be long-pressed to decrease and increase the volume, which can take some getting used to. The speakers are a compact 5.1 X 3.9 X 2.9 inches and can fit into the average palm, which makes it a good size for music-on-the-go even though it may not be the most portable of Bluetooth speakers out there. You can't carry it in your pocket like you can the Jambox Mini or the i-Box Slix since the shape is a little bulky. But it beats the two in price, at the very least. Users will no doubt wonder about the sound output that is offered at the price. Users of the Mpow Armor have been unanimous in their praise of sound quality. The bass is reasonably good for occasional outdoor use, and indoors the speaker can fill the room with a sharp, clear sound. The sound quality is surprisingly loud for a speaker this small. It can also be used to answer phone calls and as a computer speaker. Suspending it from a support like a beach umbrella or a tree should also give you the best sound, since there won't be any noise from vibrations. Turning the volume up to max doesn't cause any distortion in sound either. The speaker is fitted with a 1000 mAh Li-ion rechargeable battery that promise around 12 hours of playtime on a single charge and most users have found it to be reliable on that front. The Bluetooth 4.0 range is decent at less than 15 feet, but walls can weaken the signal, so be careful. One issue that some users have faced is that when the 3.5mm audio cable is plugged in to connect with an iPod or other mobile device without Bluetooth, the maximum volume is not as high. This may not be a problem for most people. The emergency power supply feature also lets you take an important call via your cellphone when the phone is out of power. You can plug it up to the phone and the speaker will let you take that call outdoors without a power bank. What sets the speaker apart from other 'waterproof' wireless speakers is that it definitely delivers on the water-resistance front. It has an IP65 waterproof rating, which means it can withstand water jets from any direction. Users have found that the speaker stands up to rain quite well, though it probably won't be advisable to immerse it in water for half an hour (only an IP67 rating can protect against immersion for that long). This should make the speaker safe from spray at the beach or in the shower, and even when you're caught in unexpected rain without cover. 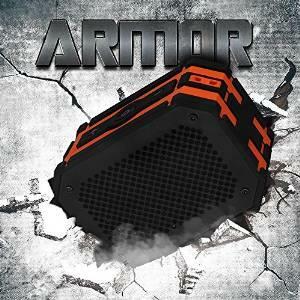 If you are looking for a sub $50 indoor/outdoor speaker for music-on-the-go, the Mpow® Armor can be safely recommended. It turns out to have surprisingly powerful sound, is reasonably portable, and ideal for taking with you to the beach or the poolside. It's hard to find portable speakers that are genuinely waterproof for this price. Users have given it very high ratings on most peer-review sites, so word of mouth as well as this reviewer recommends the speaker for portable music on a budget.